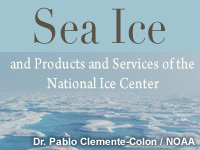 This two-hour module examines sea ice, icebergs, and the products and services of the National Ice Center and the North American Ice Service. Topics include climatology and current trends in sea ice extent and thickness; the development, classification, and drift of sea ice and icebergs; fractures, leads and polynyas; and the satellite detection of sea ice using visible, infrared, and microwave sensors. pretty good overview of Sea Ice. Good beginner course. Good initial primer regarding sea ice. Completion time is relatuvely accurate. Recall the mission of the National/Naval Ice Center (NIC). List and describe the routine products available from the NIC. Explain the procedure to request support from the NIC. On a map, show the geographical area seasonally affected by sea ice and icebergs. Recall the general time frame of when each of the geographical areas would see ice formation and melt. Describe current and forecast trends in sea ice extent. Describe the processes affecting heat loss from a body of water. Describe the development of sea ice from first stage of ice crystal formation to an ice sheet. Describe the stages of sea ice melting. Given a description of winds and currents, estimate the drift of sea ice. Recall and define the WMO categories of sea ice. Describe the origin and classification of icebergs. Describe the different elements of the ice code as used in the WMO egg code seen on ice charts. Describe coding for sea ice in a synoptic observation. Describe how sea ice is detected using environmental satellites. Interpret a Daily Ice Edge Forecast for the Arctic Ocean or Bering Sea. Identify the sea ice edge and marginal ice zone on NIC daily product. July 2014: Although the annual sea ice status has changed since this lesson was published, the conclusion is unchanged. The International Ice Patrol website has changed, but the products are still current.